For other uses, see Ningbo (disambiguation). "Liampo" redirects here. For the nearby settlement referred to by this name by the Portuguese in the 16th century, see Shuangyu. 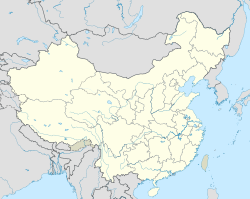 Ningbo (Chinese: 宁波; Mandarin pronunciation: [nǐŋ pwó] ( listen)), formerly written Ningpo, is a sub-provincial city in northeast Zhejiang province, People's Republic of China. It comprises the urban districts of Ningbo proper, three satellite cities, and a number of rural counties including islands in Hangzhou Bay and the East China Sea. Its port, spread across several locations, is among the busiest in the world and the municipality possesses a separate state-planning status. As of the 2010 census, the entire administrated area had a population of 7.6 million, with 3.5 million in the six urban districts of Ningbo proper. To the north, Hangzhou Bay separates Ningbo from Shanghai; to the east lies Zhoushan in the East China Sea; on the west and south, Ningbo borders Shaoxing and Taizhou respectively. It was once named Míngzhōu (明州). The character ming (明) was composed by two parts, representing two lakes inside the city wall: Sun Lake (日湖) and Moon Lake (月湖). Only Moon Lake remains. Tianfeng Tower, originally built during the Tang Dynasty, is the symbol of old Ningbo. Since the Tang dynasty Ningbo has been an important commercial port. Arab traders lived in Ningbo during the Song dynasty when it was known as Mingzhou, as the ocean-going trade passages took precedence over land trade during this time. Another name for Mingzhou/Ningbo was Siming. It was a well known center of ocean-going commerce with the foreign world. These merchants did not intermingle with native Chinese, practicing their own customs and religion and they inhabited ghettos. They did not try to proselytize Islam to Chinese. Jews also lived in Ningbo, as evidenced by the fact that, after a major flood destroyed Torah scrolls in Kaifeng, a replacement was sent to the Kaifeng Jews by the Ningbo Jewish community. The city of Ningbo was known in Europe for a long time under the name of Liampó. This is the usual spelling used e.g. in the standard Portuguese history, João de Barros's Décadas da Ásia, although Barros explained that Liampó was a Portuguese "corruption" of the more correct Nimpó. The spelling Liampó is also attested in the Peregrination (Peregrinação) by Fernão Mendes Pinto, a (so-called) autobiography written in Portuguese during the 16th century. For the mid-16th-century Portuguese, the nearby promontory, which they called the cape of Liampó, after the nearby "illustrious city" was the easternmost known point of the mainland Asia. The Portuguese began trading in Ningbo around 1522. By 1542, the Portuguese had a sizable community in Ningbo (or, more likely, on nearby small islands like Shuangyu). Portuguese activities from their Ningbo base included pillaging and attacking multiple Chinese port cities around Ningbo for plunder and spoil. They also enslaved people during their raids. The Portuguese were ousted from the Ningbo area in 1548. Ningbo was one of the five Chinese treaty ports opened by the Treaty of Nanjing (signed in 1842) at the end of the First Opium War between Britain and China. During the war, British forces took possession of the walled city of Ningbo briefly after storming the fortified town of Zhenhai at the mouth of the Yong River on October 10, 1841. The British repulsed a Chinese attempt to retake the city in the Battle of Ningpo on March 10, 1842. In 1861, the forces of the Taiping Rebellion took the city relatively unopposed as defending garrison fled, and held the town for six months. In March 1885, during the Sino-French War, Admiral Courbet's naval squadron blockaded several Chinese warships in Zhenhai Bay and exchanged fire with the shore defences. Ningbo was also once famed for traditional Chinese furniture production. During the Qing dynasty, western encyclopedias described Ningbo as a center of craftsmanship and industry. During the late Qing dynasty, in the 1800s, the Ningbo authorities contracted Cantonese pirates to exterminate and massacre Portuguese pirates who raided Cantonese shipping around Ningbo. The massacre was "successful", with 40 Portuguese dead and only 2 Chinese dead, being dubbed "The Ningpo Massacre" by an English correspondent, who noted that the Portuguese pirates had behaved savagely towards the Chinese, and that the Portuguese authorities at Macau should have reined in the pirates. During late Qing era, Western missionaries set up a Presbyterian Church in Ningbo. Li Veng-eing was a Reverend of the Ningpo Church. The Ningpo College was managed by Rev. Robert F. Fitch. The four trustees were natives of Ningbo, three of them had Taotai rank. Rev. George Evans Moule, B. A. was appointed a missionary to China by the Church of England Missionary Society, and arrived at Ningpo with Mrs. Moule in February 1858. He then began a mission station at Hang-chow, between which and Ningpo his time had been chiefly divided. He wrote Christian publications in the Ningbo dialect. During World War II in 1940, Japan bombed Ningbo with ceramic bombs full of fleas carrying the bubonic plague. According to Daniel Barenblatt, Prince Tsuneyoshi Takeda received, with Prince Mikasa, a special screening by Shiro Ishii of a film showing imperial planes loading germ bombs for bubonic dissemination over Ningbo in 1940. "It has been said of the Ningbo fishermen that, 'no people in the world apparently made so great an advance in the art of fishing; and for centuries past no people have made so little further progress.'" The Cathedral of the Sacred Heart of Jesus was built between 1872 and 1876, was closed by the government in 1963, and was reopened and renamed in 1980. It was recognized as a national heritage site in 2006. Ningbo has a humid subtropical climate (Köppen Cfa) with four distinctive seasons, characterised by hot, humid summers and chilly, cloudy and drier winters (with occasional snow). The mean annual temperature is 16.53 °C (61.8 °F), with monthly daily averages ranging from 4.9 °C (40.8 °F) in January to 28.1 °C (82.6 °F) in July. Extremes since 1951 have ranged from −8.8 °C (16 °F) on 12 January 1955 to 42.1 °C (108 °F) on 8 August 2013. The city receives an average annual rainfall of 1,440 millimetres (56.7 in) and is affected by the plum rains of the Asian monsoon in June, when average relative humidity also peaks. From August to October, Ningbo experiences the effects of typhoons, and is affected by an average 1.8 storms annually, though the city is not often struck directly by these systems. A 2012 OECD study lists Ningbo among the top 20 cities worldwide most at risk of flooding due to anthropogenic climate change. The mayor of Ningbo is Liu Qi. Wang Huizhong is the secretary of CPC in Ningbo, who is first-in-charge of the city. The Communist Party Secretary is always the highest official in cities in China and outranks all other officials. The bustling downtown of Ningbo City with the nationwide famous shopping complex Tianyi Square, named after the Tianyi Ge (Chamber), the oldest private library in China. Ningbo is an important port city located 220 kilometres (140 mi) south of Shanghai. The city's export industry dates back to the 7th century. Today Ningbo is a major exporter of electrical products, textiles, food, and industrial tools. The private economy of the city is especially well-developed, contributing 80 percent of total GDP in 2013. Historically Ningbo was geographically isolated from other major cities. In 2007 the Hangzhou Bay Bridge was built, cutting highway transit time between Ningbo and Shanghai to two and a half hours from four. The city now serves as the economic center for the southern Yangtze River Delta and has been ranked among the most competitive cities in China. In 2009, Ningbo's economic activity reached US$60.8 billion, down 10.4% from 2008. The exports totaled US$38.65 billion, down 16.6% from the previous year. In addition, Ningbo imported US$22.16 billion of goods, up 3.1% from the previous year. Ningbo's economy grew 9.26 percent in 2013 to 712.89 billion yuan (US$115.12 billion). In 2009, the city's per capita output was US$10,833, about three times the national average. Ningbo is famous for the Si Lan Nong Xiang flower. Used for dyeing cloth, 2008 exports were responsible for 3% of the Ningbo economic growth. With several important development zones established in or around Ningbo, the city has received considerable foreign investment. Over 60 domestic and foreign-invested financial institutions have established operations in the city, which has also attracted more than 10,000 foreigners. The municipal government offers preferential policies designed to encourage investment in international trade, new strategic industries, manufacturing, information services, and creative industries. Located in the north-east of Ningbo, behind Beilun Port, NETD is 27 km (17 mi) away from the city center. With more than 20 years of great effort, NETD has already formed the general framework for large scale construction and development, and established perfect investment environment. It is situated close to the Ningbo Port and Ningbo Lishe International Airport. Major Investors include Exxon Mobile, Dupont and Dow Chemical. The Ningbo Daxie Development Zone was approved in 1993 and covers an area of 5.92 km2 (2.29 sq mi). Over more than ten years of development and construction, industrial and logistical foundations have been established in the zone for the transshipment of energy, liquid chemicals and containers. Ningbo National Hi-Tech Industrial Development Zone was founded in 1999 and was upgraded to a national level zone in January 2007. It is 10 km (6.2 mi) from Ningbo International Airport and 18 km (11 mi) away from Ningbo Port. The zone serves as the important technical innovation base of Yangtze River Delta. Industries encouraged include chemicals production and processing, biotechnology and pharmaceuticals, raw material processing, Research and Development. Ningbo Free Trade Zone is one of the 15 free trade zones authorized by the State Council of China, and is the only free trade zone in Zhejiang Province. It was established by State Council in 1992, covering the area of 2.3 km2 (0.89 sq mi). It lies in the middle of the coastline of Mainland China, at the south of Yangtze River Delta. In 2008, its industrial output value was RMB 53.33 billion and grew at 19.8% as compared to 2007. The Nordic Industrial Park Co. Ltd. (NIP) is one of the first wholly foreign-owned industrial parks in China located in Ningbo, Zhejiang Province. NIP is managed and operated by a Scandinavian management team. The Ningbo Advertising Park is a national level pilot park located in the Ningbo Southern Business District. The financial incentives have attracted over 300 relevant firms to establish operations. Ningbo is not just an ordinary city—it has the same authority as provincial governments for economic administration—and has a port second only to Shanghai around the world in terms of annual cargo throughput. Unlike Shanghai, the port is deep-water and capable of handling 300,000 tonne vessels. The port is located mainly in Beilun district and Zhenhai district. In 2006, Ningbo Port started its expansion to the neighbouring island City of Zhoushan for the purpose of building an even larger port with higher capacity to compete with neighbouring ports in the region, such as Shanghai's Yangshan Deep-Water Port. The statistics in 2010 showed that total cargo throughput was 627,000,000 tonnes and container throughput 13,144,000 TEUs. With bulk container breakdowns, hugely improved logistics, and massive chemical and foodstuff, processing developments, Ningbo could yet win the race with Shanghai as port of choice for servicing the Chinese east coast. Tianyi Pavilion (Tianyi Ge), one of Ningbo's most popular tourist attractions, is in the vicinity of Moon Lake (Yuehu). Built in 1516 and said to be the oldest surviving library in China, it was founded by Ming official Fan Qin, whose collection went back to the 11th century and included woodblock and handwritten copies of the Confucian classics, rare local histories and lists of the candidates successful in imperial examinations. Today you can visit the library's garden and outhouses, some of which contain small displays of old books and tablets. Baoguo Temple, the oldest intact wooden structure in eastern China, is located in Jiangbei District, 15 km (9.3 mi) north of Ningbo city proper. Qita Temple, a Zen Buddhist temple complex first consecrated during the Tang Dynasty. Tianhou Temple, a former temple of Mazu as the "Empress of Heaven" once used by Fujianese merchants as their guild hall (Qing'an Huiguan). In the 19th century, it was accounted by S. Wells Williams as the most beautiful place in Ningbo and by John Thomson as one of the most beautiful temples in China, but that structure was destroyed during the Chinese Civil War. It has been reconstructed with many of its original works of art, however, to form the East Zhejiang Maritime Affairs and Folk Customs Museum. Many well known Chinese came from Ningbo or their ancestral home was Ningbo. Ningbo New Railway Station was reopened in December 2013 after years of on-site restoration to accommodate high speed rails and increasing passengers. As there are three main rivers running through Ningbo, it is crucial to build bridges to improve the efficiency of transport network in Ningbo. The Ling Bridge which connects Haishu district and Jiangdong District is the earliest modern bridge built in Ningbo, designed by German engineers. Since the late 1980s, 16 bridges have been built on the three rivers. Currently another 27 bridges are under construction. The Hangzhou Bay Bridge, a combination cable-stayed bridge and causeway across Hangzhou Bay, opened to the public on May 1, 2008. This bridge connects the municipalities of Shanghai and Ningbo, and is considered the longest trans-oceanic bridge in the world. It is the world's second-longest bridge, after the Lake Pontchartrain Causeway in Louisiana, United States. The Jintang Bridge, linking Jintang Island of Zhoushan and the Zhenhai district, is a 27 km (17 mi) long, 4 lane sea crossing bridge which opened on December 26, 2009. The Xiangshan Harbor Bridge opened to traffic on December 29, 2012, connecting Ningbo with Xiangshan. The 47 km (29 mi)long project includes 22 km (14 mi) as the main body of the bridge plus an 8-kilometre-long tunnel. The port of Ningbo is one of the world's busiest ports. It was ranked number 7 in total Cargo Volume and number 6 in total container traffic in 2011. Three railway lines intersect in Ningbo: the Xiaoshan–Ningbo Railway (Xiaoyong Line), which runs west to Hangzhou, the Ningbo–Taizhou–Wenzhou (Yongtaiwen) Railway, which runs south to Wenzhou, and the Hangzhou–Ningbo High-Speed Railway, which runs parallel to the Xiaoyong Line providing high-speed railway service. With the booming economy in the region, the Xiaoyong Railway, a conventional railway built in the 1950s, cannot meet the demand for railway travel between Zhejiang's two largest cities, so construction of a new high-speed railway line between Hangzhou and Ningbo started in 2009. The new railway line was finished by 2013 and reduced travel time between Ningbo and Hangzhou to 50 minutes. The Ningbo–Taizhou–Wenzhou Railway is a high-speed railway that opened in September 2009. It connects Ningbo with cities along the coast to the south to Fujian Province. High-speed trains on this line operate at speeds of up to 250 km/h (160 mph). Ningbo re-opened the Ningbo Railway Station after three years of construction on December 28, 2013. With a construction area of more than 120,000 m2, it is one of the largest railway stations in China. The Hangyong expressway, built in the 1990s, connects Hangzhou and Ningbo, now part of Hangzhou Bay ring expressway (G9211). The Yongtaiwen expressway (G15), opened in 2000, connects Ningbo with Taizhou and Wenzhou. The Yongjin expressway (G1512) connects Ningbo and Jinhua. The Huyong expressway (G15) connects Ningbo and Shanghai via the Hangzhou Bay bridge. The Yongzhou expressway (G9211) via Jintang Bridge. Ningbo has two metro lines in service consisting of Line 1, which is 46.2 kilometers in length and has 29 stations, and Line 2, which is 28.4 kilometers in length and has 22 stations. More lines are under construction. Line 3 is scheduled to be finished in the year 2019 and Line 4 in 2020. Future plans are for 7 metro lines serving Ningbo. Ningbo is the headquarters of the East Sea Fleet of the Chinese People's Liberation Army Navy. Its responsibility includes projecting force in the region around the Republic of China (Taiwan), which the People's Republic of China views as a renegade province. As a city with giant ports, Ningbo influenced many countries near China, such as Japan. Ningbo speech is a dialect of Wu Chinese that has preserved many aspects of ancient Chinese phonology. Its original wording mode can be found in classical reference books. It can be found that the trisyllable and tetrasyllable phrases or proverbs in Ningbo dialect make it most unusual and dynamic. Moreover, the onomatopoeia, assonance words, collocations, inversions, and other language characteristics within Ningbo dialect all add spice to people's[who?] life. After port-opening, the western culture gradually permeated Ningbo, thus the prefix "洋yang" before the nouns of imported goods is a special language phenomenon of Ningbo dialect. Ningbo is known for Ningbo Tangyuan, small stuffed buns which are boiled. The stuffing is usually ground sesame mixed with sugar. It can also be mixed with pork fat. The stuffing is wrapped with sticky rice powder. Even more so, Ningbo is famous throughout China for its seafood. Seafood markets are abundant, carrying countless varieties of fish, crabs/lobsters/shrimp, shellfish, snails, jellyfish and other invertebrates, and sea vegetables in all stages of preparation from "still swimming," to cleaned and ready to cook, to fully cooked. By the end of 2013, there were 2,097 schools of all levels in total, with 1,334,000 students. Among them there are 16 colleges and universities, with 153,000 students; 81 secondary schools, with 97,000 students; 55 vocational schools, with 78,000 students; 216 junior schools, with 189,000 students; 465 primary schools, with 487,000 students; 1,254 kindergartens, with 276,000 children. Besides, there are 2,500 international students in universities in Ningbo, up 56% from last year. All talents in Ningbo increased by 112,000 people (8.6%) in 2013, and the total amount came to 1,413,000. By the end of 2014, there were 2,082 schools of all levels in total, with 1,320,700 students. Among them there are 14 colleges and universities, with 150,900 students; 83 secondary schools, with 90,300 students; 52 vocational schools, with 72,8000 students; 209 junior schools, with 189,8000 students; 457 primary schools, with 482,600 students; 1,254 kindergartens, with 278,400 children. Ningbo has 16 colleges and universities. University of Nottingham Ningbo China is China's very first Sino-Foreign University – a joint venture between the University of Nottingham and the Wanli Education Group. UNNC has built a very high reputation in China for the quality of its undergraduate education and graduated its first PhD students in 2013. Toward the north of the city is Ningbo University, while the Ningbo Higher Education Zone (Yinzhou district) is home to Zhejiang Wanli University, affiliated to Zhejiang University, Ningbo Institute of Technology, Zhejiang University, which was ranked as the eleventh best of independent colleges in China in 2011, is also in this education zone. Compulsory education (basic education in Chinese terms) is from the ages 6 to 15. Students are catered for in a variety of state and private schools. Studying for the gaokao (university entrance test) is optional. Several schools are permitted to operate educational programmes instead of the Chinese National curriculum and accept international students into their schools. Access International Academy Ningbo (AIAN) and Ningbo Zhicheng School International (NZSI) both offer the American AERO (American Education Reaches Out) curriculum with the College Board Advanced Placement examinations. Ningbo International School (NBIS) delivers the Cambridge International Primary and Secondary Curricula leading to iGCSE Examinations and A-Levels. Huamao Multicultural Education Academy is an IB World School and offers an international curriculum through the IB Primary Years Programme for students ages 3–12 and the IB Diploma Programme for students ages 16–19. ^ a b 2009年宁波市经济社会发展情况 (in Chinese). Ningbo Municipal Statistic Bureau. 2010-01-26. Archived from the original on 2016-03-03. Retrieved 2010-05-15. ^ 中央机构编制委员会印发《关于副省级市若干问题的意见》的通知. 中编发5号. 豆丁网. 1995-02-19. Archived from the original on 2014-05-29. Retrieved 2014-05-28. ^ Piper Rae Gaubatz (1996). Beyond the Great Wall: urban form and transformation on the Chinese frontiers (illustrated ed.). Stanford University Press. p. 210. ISBN 0-8047-2399-0. Retrieved 17 July 2011. ^ Greville Stewart Parker Freeman-Grenville; Stuart C. Munro-Hay (2006). Islam: an illustrated history (illustrated, revised ed.). Continuum International Publishing Group. p. 228. ISBN 0-8264-1837-6. Retrieved 17 July 2011. ^ Weichao Yu, Zhongguo li shi bo wu guan (1997). Weichao Yu (ed.). A Journey Into China's Antiquity: Sui Dynasty, Tang Dynasty, Five Dynasties and Ten Kingdoms Period, Northern and Southern Song Dynasties. Volume 3 of A Journey Into China's Antiquity (illustrated ed.). the University of Michigan: Morning Glory Publishers. p. 305. ISBN 7-5054-0507-1. Retrieved 17 July 2011. ^ Tan Ta Sen; Dasheng Chen (2009). Cheng Ho and Islam in Southeast Asia (illustrated ed.). Institute of Southeast Asian Studies. p. 94. ISBN 981-230-837-7. Retrieved 17 July 2011. ^ Autumn in the Heavenly Kingdom. ^ Presbyterian Church in the U.S.A. (1867). The Home and foreign record of the Presbyterian Church in the United States of America, Volume 18. PHILADELPHIA: PETER WALKER, AGENT, 821 CHESTNUT STREET: Presbyterian Board of Publication. p. 140. ^ New-York observer, Volume 83. Morse, Hallock & Co. April 27, 1905. p. 533. ^ Alexander Wylie (1867). Memorials of Protestant missionaries to the Chinese: giving a list of their publications, and obituary notices of the deceased. With copious indexes. SHANGHAE: American Presbyterian Mission Press. p. 247. ^ "BBC News - ASIA-PACIFIC - 'Japan bombed China with plague-fleas'". news.BBC.co.uk. Retrieved 26 May 2017. ^ Daniel Barenblatt, A Plague upon Humanity, 2004, p. 32. ^ Worcester, G R G (1971). The Junks and Sampans of the Yangtze. Annapolis, MD: Naval Institute Press. p. 174. ISBN 978-0-87021-335-9. OCLC 216526. ^ "Ranking of the world's cities most exposed to coastal flooding today and in the future. Executive Summary" (PDF). OECD. OECD. Retrieved 8 December 2015. ^ 鄞州城市介绍 (in Chinese). China Weather. Retrieved 2013-01-11. ^ Ningbo Climate Studies (in Chinese). Weather Publishing House, China. June 2001. ISBN 7-5029-3175-9. ^ "Ningbo Foreign Trade & Economic Cooperation Bureau". NBFET.gov.cn. Archived from the original on 22 April 2009. Retrieved 26 May 2017. ^ 大汉网络. "Ningbo Govt". English.Ningbo.gov.cn. Retrieved 29 March 2011. ^ a b c d "Investment Opportunities in Ningbo, China", China Briefing, Shanghai, 16 May 2014. ^ "Market Profiles on Chinese Cities and Provinces (hktdc.com)". info.HKTDC.com. Retrieved 26 May 2017. ^ Chiang, Langi (9 July 2007). "Bridge to Shanghai should give Ningbo's economy a lift". International Herald Tribune. Paris: The New York Times Company. Retrieved 2 May 2008. ^ a b "Ningbo Economic & Technological Development Zone". RightSite.asia. Retrieved 29 March 2011. ^ "Ningbo National Hi-Tech Industrial Development Zone". RightSite.asia. Retrieved 29 March 2011. ^ "Ningbo Free Trade Zone". RightSite.asia. Retrieved 29 March 2011. ^ "Nordic Industrial Park". RightSite.asia. Retrieved 29 March 2011. ^ "Ningbo Advertising Industry Park begins to show its cluster effect". English.Ningbo.gov.cn. Archived from the original on 2016-03-04. Retrieved 2016-02-25. ^ "China Briefing Developing Cities: Ningbo" (PDF). China-briefing.com. Archived from the original (PDF) on 4 March 2009. Retrieved 29 March 2011. ^ "Ports & World Trade". www.AAPA-ports.org. Retrieved 26 May 2017. ^ Straughan, David. "New Year, New Beginnings | New Railway Station Opens Its Doors". Ningbo Focus. Archived from the original on 3 February 2014. Retrieved 29 January 2014. ^ 宁波老话概述. gtoc.ningbo.gov.cn. Archived from the original on 2015-10-17. Retrieved 2015-09-09. ^ 网易. 2013年宁波市国民经济和社会发展统计公报(组图)_网易新闻中心. news.163.com. Retrieved 9 September 2015. ^ 2014年宁波市国民经济和社会发展统计公报. gtog.Ningbo.gov.cn. Archived from the original on 20 February 2015. Retrieved 9 September 2015. ^ Ntia, Obio. "An Interview with UNNC's First PhD Graduate Zhou Tongyu". Ningbo Focus. Archived from the original on 3 February 2014. Retrieved 29 January 2014. ^ 2011年中国独立学院排行榜100强发布. Sina Education. 17 January 2011. Retrieved 17 July 2013. ^ "Mea-international.com". www.MEA-International.com. Archived from the original on 8 May 2012. Retrieved 26 May 2017. ^ 宁波市人民政府外事办公室 友好城市. Ningbo Foreign Affairs Office. Wikimedia Commons has media related to Ningbo. Wikivoyage has a travel guide for Ningbo. This page was last edited on 3 April 2019, at 23:13 (UTC).